Even with all the hardships, Amelia’s story wasn’t much different from most of the folks traveling the Oregon Trail. Long wagon trains of families trekked across the plains, doing all they could to stay together in order to help each other. Struggling over treacherous mountain passes and parched deserts, the pioneers inched their way west in long, snaking wagon trains. The forerunners of the American dream lived through hail storms, pelting rain, muddy trails, lost livestock and dreaded diseases like cholera, which caused excruciatingly painful death within hours. Nowhere was the human struggle more poignantly played out than in the migration of settlers to the western United States in the 1800’s. They came from Ohio, Illinois, Kentucky, and Tennessee, looking for the land of plenty in Oregon that they had heard about. They braved all that Mother Nature and life could throw at them; illness, accidents, and unthinkable hardships were just par for the course. Broken down wagons, scarce food and water, barren landscapes to trudge across, and hostile Natives were just some of the challenges they faced. Despite all this hardship and misery, new births, gorgeous scenery, weddings, and campfire dances were also part of their trek across the plains. Such things were recorded in the diaries of the women of the wagon as they inched across the new frontier; they were determined to outlast the Oregon Trail. Their mode of transportation was the renowned covered wagon; the pickup truck of its day. What gave them the strength to carry on? It was the promise of fertile land and a new-found freedom. For some, it was the call of the wild, the promise of independence and a fresh start. This was their chance to forge new paths and create the original American dream. For others it was the lure of the California gold rush of 1848; gold fever was already at epidemic proportions by the time the pioneers began heading west. The Oregon Trail was a route blazed by fur traders. It went west along the Platte River in Nebraska, through the Rocky Mountains via the South Pass in Wyoming and then northwest to the Columbia River; the largest river in the Pacific Northwest. German immigrants built the first covered wagons around the year 1717 in the area near the Conestoga River in Pennsylvania, thus the name Conestoga Wagon. These wagons, also called “prairie schooners” were built extra sturdy and were able to haul up to six tons of freight. They were designed like a boat with both ends of the floor of the wagon curved up to prevent goods from falling out as the wagon bumped along rocky roads and through mountain passes. Thus, the name prairie schooner. The covering of the Conestoga wagon was a large piece of canvas soaked in oil to make it waterproof and then stretched over wooden hoops and secured to the bed of the wagon. Pioneer women spun the linen for the covers of the wagons themselves; they called the covers bonnets. The Conestoga wagon is not the same as the covered wagon in that it was built much sturdier than the covered wagons that made their way west. Conestoga wagons were used mainly in Pennsylvania, Maryland, Ohio, and Virginia. The covered wagons that most folks went west in did not have the curved floors nor could they haul as much freight as the sturdy Conestoga’s. Still, the wagons that went west were built tough. The wagon wheels were made of hickory or oak and had rims of iron. The wagons had no brakes or springs, so the pioneers tied chains around the rear wheels to lock them or provide a drag whenever they had to go down steep hills; which they often did. These sturdy wagons carried pioneer families and all their worldly goods across the uncharted terrain of America. Standing 7-8 feet tall and 10-15 feet long, the covered wagons of yesteryear were symbols of freedom. They were the vehicle that would carry the pioneers across the rugged terrain on their way to the building of America; and they had to be as tough as the pioneers who drove them. 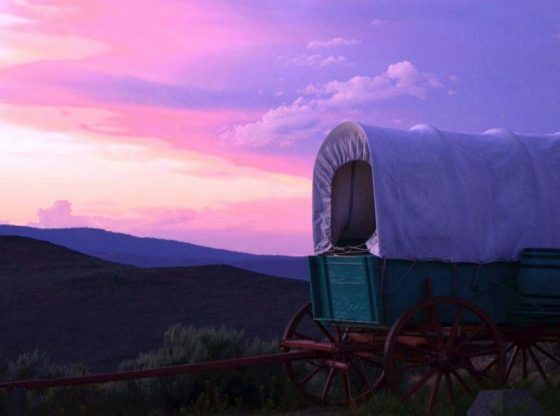 Traveling west in a covered wagon was truly one bold, daring and extraordinary journey for the pioneers of the 1800s. It was a grand life but a tough one. The promise of a better life drove them onward mile after grueling mile. At times, the trip probably seemed as impossible as the terrain was impassible. As they surveyed the lay of the land they must have felt overwhelmed; but their pioneer spirit pushed them to forge ahead. If it rained, they might only be able to travel one or two miles a day, due to washed out trails. Families sometimes had to abandon their covered wagons along the way due to the roughness of the roads and make the rest of the trip on foot. Oxen were often chosen to pull the wagons because they were the strongest animals around. The oxen were controlled by an ox yoke; a curved wooden beam fitted to a pair of oxen so that they could work together pulling the covered wagons. Today, ox yokes are collected as primitive pieces of Americana. Oxen also had to be shod if they were to make it across the new frontier; so special shoes were forged of iron and carefully fitted to each ox. These shoes played an important role in the pioneer’s expansion of the new frontier; making it more likely that the pioneers would reach their destination. Fields of magnificent wildflowers, rushing rivers, and breathtaking views awaited them along the way to the new land. But many times, the pioneer families had to go for days without water while traveling through open, often hostile, territory. Mothers gave their last swallow of water to their children; fathers worried as parched oxen trudged ahead. But the pioneers were hardy people and most of them persevered until water was found. They often had to lighten the load of the wagon by discarding items along the road or getting out of the wagon and walking along beside it. It’s said that the Oregon Trail was littered with the clothes, dishes, and furniture the pioneers had to leave behind to lighten the load as the trail became rougher and the oxen wearier for lack of water or food. This was the motto that dictated the lives of the people traveling west to the new frontier. The pioneers had to be very careful how they packed their wagons. They didn’t want to overload them and make it impossible for the oxen to pull the wagon; the maximum weight the wagons could hold was 2,000 to 2,500 pounds. A well-stocked wagon could mean the difference between life and death as they traveled through stark and unfamiliar lands. The typical journey lasted four to six months and the wagons had to hold enough provisions for the entire family for the long trip. Some of the things the pioneers had to carry included tools like shovels, hammers, axes, rope and grinding stones. Personal items would include clothing, rifles, knives, toys, and of course the family Bible. Food may have been the thing that took up the most weight. A large amount of flour was required, at least 200 pounds for each person of the family, and each family carried at least 50 gallons of water. Other necessities were bacon, rice, coffee, sugar, salt, beans, and cornmeal. Food had to be rationed very carefully along the way, as did the water; they never knew when they would find a lake or spring along the way. In addition to all the above, the pioneers carried household goods like coffee grinders, butter churns, bedding, spinning wheels, rocking chairs, cradles, buckets, Dutch ovens, and eating utensils. Wisely making use of every square inch of space, they attached hooks to the hoops inside the wagon to hold clothes, buckets, weapons, etc. Pioneer woman Margaret Frink wrote in her diary: “The wagon was lined with green cloth, to make it pleasant and soft for the eye, with three or four large pockets on each side, to hold many little conveniences–looking glasses, combs, brushes, and so on.” So, as you can see, the pioneers were experts at making use of every little bit of space; they made their supplies last and they were also tough enough to outlast the Oregon Trail. They kept their eyes on the prize all the way across the country through countless, unthinkable trials and tribulations; and they laid the groundwork for the American dream; for the generations of Americans and immigrants that would one day follow in their footsteps.